Here's the link to the page: http://publicaccess.staffsmoorlands.gov.uk/portal/servlets/ApplicationSearchServlet?PKID=103314 but it seems enthusiasts have hugged it to death. I can't decide what it looks like most, I think GCI but could be RMC but there doesn't seem to be any obvious inversions? Unless they're pulling a Smiler with it all in GDO and this is just a courtesy to the council so some inversions might appear later? Definitely has a layout akin to a wooden. Can't quite make out map though, is the top north with the pirate area to the left? The brown circle is the flume station I think. Womp womp, that's a GCI. Which fits with what I'm hearing on the grapevine. Hopefully it turns out to be an RMC but looking at that plan I think a GCI is very likely. I wonder how Merlin will market this as a 'World's first'. Ah yeah, sorry, should have looked harder than I did for the topic! If it is just a family friendly little ride then it seems a bit of waste of a fairly large area for development? Unless they plan to expand further into the woods after this opens and beds in a little? I'd imagine the building for a pre-show will feature something to make it a world first sort of thing. Eh, thought it looked a bit short at first glance, moreso when seeing it super imposed onto the Flume area. I'm happy - Due to the location, we hopefully won't get dilapidated theming. (otherwise I have HAD IT). If the numerical markings are height above sea level (or similar) in metres, then it's on got around 20m/65ft of height. But that isn't far off the height of White Lightning, so it could still be a thrilling ride, if not the most spectacular. I'd love it to be a GCI and I'd love it if Thorpe would follow suit with one behind SWARM too. It does look very woodie-like, which is good, but the shortish layout worries me a bit. After all the fuss about the British public not being interested wooden coasters, what a hindrance it could be if the first new one was a bit duff. At least it'll look impressive over the water like that when walking up towards it. If this is legit it definitely points to a standard woodie and not a launched RMC that was rumoured. I think everyone is on the right track with GCI, the section where the 3 bits of track run parallel looks very 'GCI'. Still very happy that it does look like Alton will finally get its woodie even if it does look a tad short. No gimmicks? No world record attempts? No prototype technology? Maybe they're finally playing it safe! After that lawsuit, and considering the price of doing something extraordinary, I wouldn't blame them for playing it safe. To buy off the shelf, but the best of the shelf at that. Besides, "the first new wooden coaster in the UK in 20 years" isn't a too bad phrase to build on from a marketing standpoint. It'll be something new to much of the target demographic, and considering the advances in coaster design and technology, they could feasibly market it as "the best wooden coaster in the UK" too. It could also be seen as a bit of a pioneering project for that rumoured Thorpe woodie. If this one is a big hit, roll out something bigger and better at Thorpe a couple of years down the line. If it flops, then quietly shelf those plans and find something else for Thorpe. Some people on Facebook have been doing a bit of digging and found some info: 62ft tall, with a first drop of around 20ft, turn, then a 49ft drop (sort of similar to Shockwave at Drayton?). 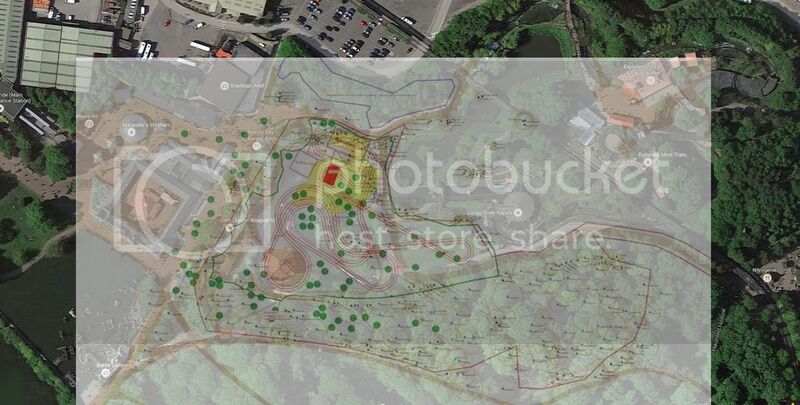 There'll be 3 tunnels, plus 3 theming structures, including utilising the Flumes old station. Sounds fun, and looks a good length for a small woodie!